Using Version Control System (henceforth VCS) has now become an essential part of the development life-cycle. One cannot visualize life when it comes to managing project/product releases without having well established VCS. As per my experience (and since got chance to work with only VSS and SVN, I feel SVN is the better choice – simple, easy and most important free!!!). Well but there is one problem with both the listed VCS, both of them work pretty well on Text based files and are not meant for storing non-textual files. In day to day development environment where developers write thousands lines of code, they also make use of already written libraries to reduce the development effort and use what is already tested & proven. (In Java world the libraries are available in JAR file format). While libraries are in compiled format, using VCS for storing them doesn’t sound to be good idea. In fact when it comes to following mavenised structure of branches, tags and trunks, the decision to store JAR files becomes critical and SVN seems to be not a right choice to store them. Unnecessarily copying JAR files in tags and branches would simply end up increasing repository size. Hence using special repositories like Apache Archiva for JAR files along with Maven POM scripts seems to be right choice. While one can handcode the POM script using any text-based editor, it would be good to use User Interface to manage the Scripts and locate the Maven artifacts like plugins, dependencies etc. Here comes the rescue from M2Eclipse (sonatype), which provides Eclipse plugins to manage POM scripts. Well if you think, it just provides a form based interface to manage scripts and does nothing, then you must have a look at the features provided by M2Eclipse plugins. It won’t be possible to explain all the features provided by this plug-in in this article, there are so many sections and configurations available that one can write a book for their explanation. Lets understand the important sections required to use this plug-in in Eclipse. 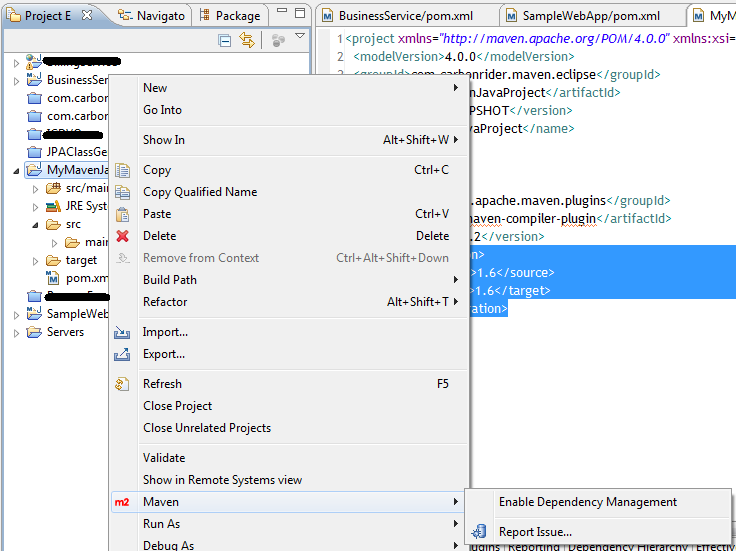 Once the plug-in is installed, you should see “Maven” as one of the item in Eclipse > Window > Preferences window. The next step is to configure the Maven installation in Plug-in and it can be done in Preferences window using Maven > Installations and click on Add button. Point to the directory location where you have unzipped/installed Maven (I am using Maven 3 along with Apache Archiva). The last step is to configure the Maven settings file in Eclipse Plug-in, so that Plug-in can use the settings that you have customized in settings.xml rather than using predefined settings. This can be done using Maven > User Settings and then select the settings.xml file. (In my case the file is available in Maven installation folder > conf. It is recommended to use local repository server like Apache Archiva as after the Eclipse maven plug-in is configured, it starts to index the repository to tune the search operation. If one uses default settings, the plug-in will query repo1.maven.org everytime it starts and that will take too much of time). 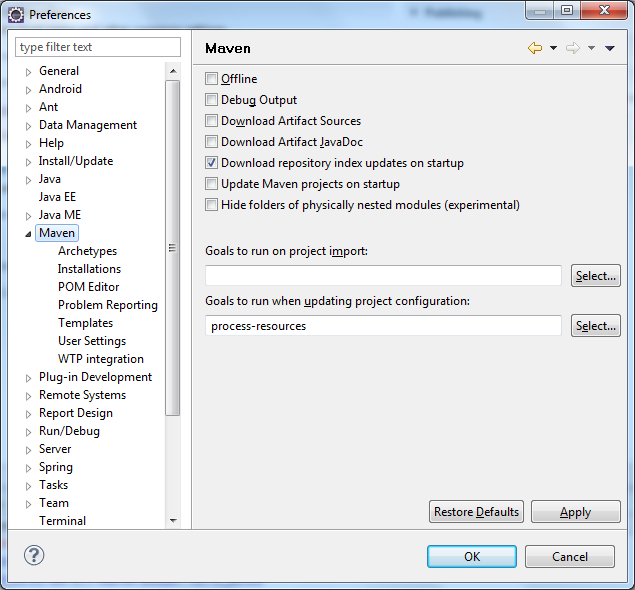 Once above configuration is done, you should be able to use Maven Eclipse plugin for your project. Create a Project using Eclipse > File > New > Project. Note that this project should not be associated with any builder and hence I have selected “Project” instead of “Java Project”, Maven plug-in will automatically configure the required nature and builders for this project. Next step is to right click on created project and select New > Other option. Search for “Maven”, you should see following options. Select “Maven POM File” and click “Next”. The dialog will ask to configure POM script with options like artifactId, groupId etc. Enter the required values and choose “Jar” as packaging option. A POM.xml file will be created in your project. Double click on the POM.xml file and Eclipse will now open “Maven POM Editor”. You will find many tabs below editor screen to configure various POM Script configurations. Go to “Plugins” section and in “Plugins” panel, click Add button. You should now see a dialog box. 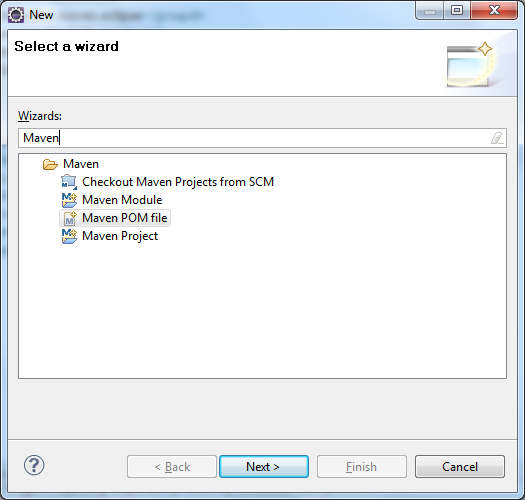 Enter “maven-compiler” and the dialog must list matching Maven Plugins to the entered text. Select “2.3.2 – maven-compiler-plugin…” from given options and click OK. Now go to pom.xml tab to open the script in XML text editor mode and add following configuration to maven-compiler-plugin. 3. Change project icon to indicate it is Maven and Java Project. The definite advantage of this approach is that now developers doesn’t have to run for locating required JAR files, one just need project source and its related POM.xml file. The Maven plug-in will automatically configure the required setting to compile and run your project. But still there is one problem when you want to develop Web Project and run it in Eclipse WTP environment (Pre-configured servers like JBoss, Tomcat etc in Eclipse environment). The WTP will not be able to identify the projects created using above steps. Well sonatype has also thought about it and has created one more plug-in to solve this problem. I will provide the details about same in next article.